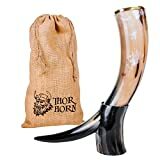 If you're going to drink beer, then drink it like an ancient Viking warrior would with this cool new Glass Viking Beer Horn. 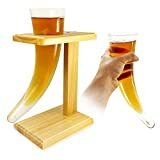 This horn-shaped pint glass is the perfect beer drinking vessel for chugging down cold ones at epic feasts, backyard BBQs, sporting events, man caves, or after any brutal victory or good conquering. 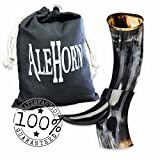 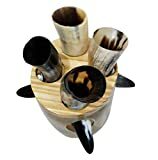 Rather than slaying a mighty bovine for its horn to drink booze from, this one is made from animal-friendly glass and includes a rustic wooden stand with a genuine leather strap for securing the horn down while it's proudly on display. 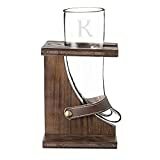 It makes the perfect gift for beer lovers, thirsty warriors, or even Minnesota Vikings fans and is sure to be battled over in a white elephant holiday gift exchange.